A beautiful stone, brought about by the natural fusion of Amethyst and Citrine – giving the stone orange and purple patches. Especially fine quality pieces may have a distinct division between the two colours. A gorgeous stone, also known as bolivianite, is a naturally occurring variety of quartz which is only naturally found in Bolivia. It is a mixture of amethyst and citrine with areas of purple, yellow and/or orange that offer a unique and distinctive contrast. It is possible to create synthetic pieces of this stone – in the same way that synthetic Citrine is created. Amethyst is heat treated to give it a orangey colour – with heat applied in a certain place, a patchy effect can be created. It can be very difficult to determine whether a piece is natural or synthetic, unfortunately. Almost all the naturally occuring pieces are found in Bolivia, but synthetic stones are made in China, Russia, and more. 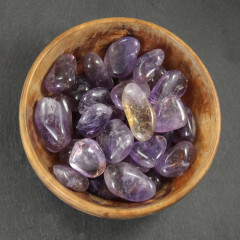 The stone is said to have the combined metaphysical properties of both amethyst and citrine, as well its own unique properties as a meditative aid. It is also said to relieve tension, disperse negativity and help to eliminate prejudice. Despite not being classed as a birthstone in its own right, it can be considered the combined birthstone of both February or November, due to being a combination of Amethyst and Citrine. It is assigned to the Third Eye Chakra.